**Please see The Antrim Coast Road for a beautiful pictorial tour. It was, by the standards of the day, a crazy plan - to open the inaccessible Glens of Antrim by blasting a road along miles of towering sea cliffs. But it was the 1830s and the Victorians were full of confidence. A Scottish engineer William Bald, had the vision and the money was secured to build a road that would become one of the most iconic coastal drives in Europe. It would remain largely unchanged for more than 100 years. Before it, people relied on muddy tracks that rose and fell over the steep-sided glens. In winter the area was cut off. The 12 miles of sea to Scotland was a much easier trading route. It was there that goods were sold and marriages made. Bald's road, planned as a `Grand Military Way` and built when the United Irishmen rebellion of 1798 was still fresh in the memory, would change all that. The Antrim Coast Road, or A2 to give it its functional title, runs from Larne to the Giant's Causeway taking in a series of seaside villages that nestle by the shore where the glens slope to the sea. It hugs the rocky headlands of Glenarm and Garron Point. They presented a huge obstacle to William Bald, and still give problems today. 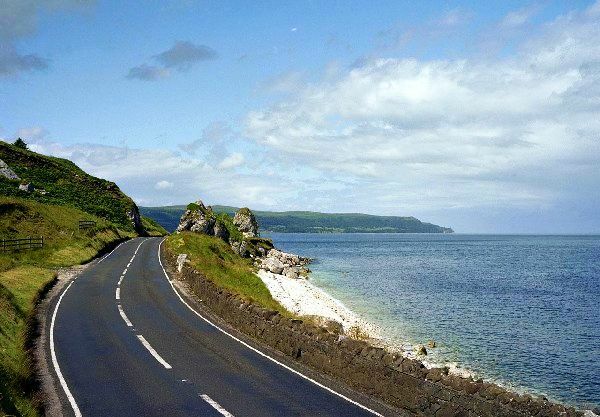 The most scenic 25 mile section stretches from the Black Arch at Larne to the Red Arch at Cushendall, a road once likened to a "snake tied by its tail which curves and loops its way along the rocky coastline." But in 10 years, Bald, assisted by hundreds of workers from the glens blasted his way along the coast, blowing hundreds of tonnes of rock onto the shore where labourers fashioned a road lapped by the sea. The project, he wrote in 1834, had two particular difficulties. "One the necessity of conducting the road under a very considerable extent of rock, and the other, its passage along portions of very steep hills of moving clay bank." "William tackled this with gusto, but it was a big challenge," he told A Radio Ulster documentary, The Beauty and the Beast. "The original estimate for the road was £25,000 and the commissioners were more than a little upset when it turned out to be almost 50% over budget, it actually cost £37,000. "The road was started in 1832 and finished in 1842 and it's even more remarkable when you think it was done without any mechanical equipment. It was all manual labour." And both the sea cliffs and the unstable clay banks, or slow landslides Bald encountered still need constant monitoring and maintenance. Today that's done under the direction of Clive Robinson of the Roads Service. "I look upon the road as a beauty and a beast. There's the undoubted beauty of it, the beast is the work we have to do with it." "There are a number of issues and they all relates to the varying geology around the coast road. It relates to rock faces where you've rock falls and landslides. "You also have sea defence problems with storm damage to the sea walls, so quite a range of problems based on geology and what nature is throwing at the coast road." At Garron Point a project has been completed to protect drivers from the risk posed by the road. It was closed for months as a huge net was thrown over the sea cliffs to stop rock falls. It's one of the narrowest points along the route where the limestone and basalt face tower for 100 metres above the nervous driver. It's the last of work at the site where £600,000 has been spent in the past three years. If Bald's road was ambitious when he started it in 1832, it's a route that would never be built today says David Orr. "One of the conundrums of this road is that if we were trying to build it today I don't think it would be allowed. "This is an area of outstanding natural beauty. I think it would be a difficult and expensive road to improve to any great extent and I just wonder if the charm of it might be taken away by any major development."